Are you a person that likes to keep track of your time and the events in your life? Have you been meaning to get more organized? In either case, Blackboard has a calendar tool that you can use to record important dates such as homework due dates, sports events, and project deadlines. Your instructor may also use Blackboard’s calendar to help remind everyone about class meeting times, quiz and exam dates, and office hours. Similarly, Blackboard support staff may post events important to all Blackboard users like system maintenance and outage schedules, Blackboard workshops, and online webinars. The best part is that you can see all of the system-wide events, course events, and personal events in one calendar. It’s almost as if you have others helping you manage your calendar. 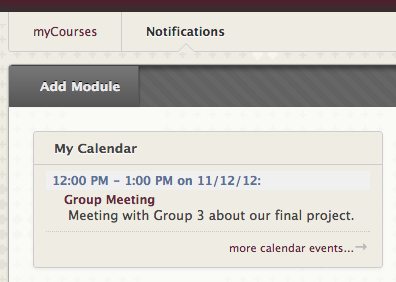 The Calendar tool may appear as a module inside your courses or can be added to your Notifications dashboard. To add personal events to the Calendar and view all events, you must access the Calendar through the module on the Notifications dashboard. You will not be able to add events to the calendar in your individual courses, nor will you be able to view personal calendar entries using the course calendar. Whether you enter the Calendar from the Notifications dashboard or from within your individual courses, you can use the following features to view the Calendar and find posted events. Viewing Tabs The viewing tabs allow you to see events listed by day, week, month, or year. Quick Jump Use the Jump to button to quickly find a day or portion of the Calendar. 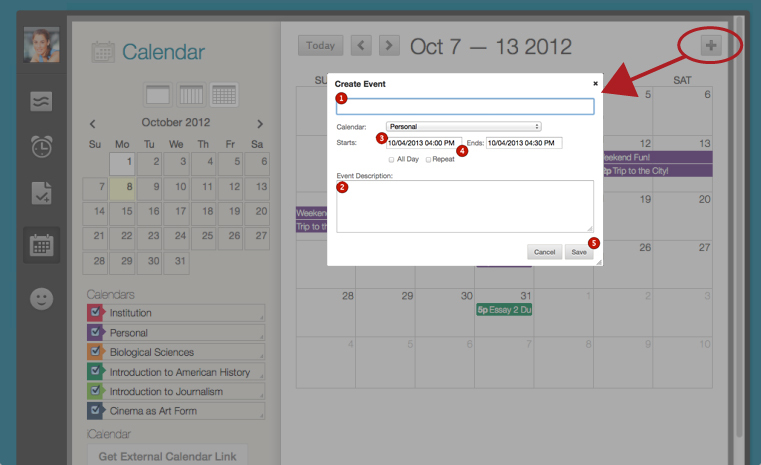 Create Event Click this button to create new personal calendar events. Display Event Change which events are displayed from all to individual courses, system events, etc. Calendar Paging Use the arrows to page through past or future events within the chosen display option. Calendar Event Links to individual calendar events. Today Indicator The yellow box marks the current day on the month view. This box is dark grey on the year view. 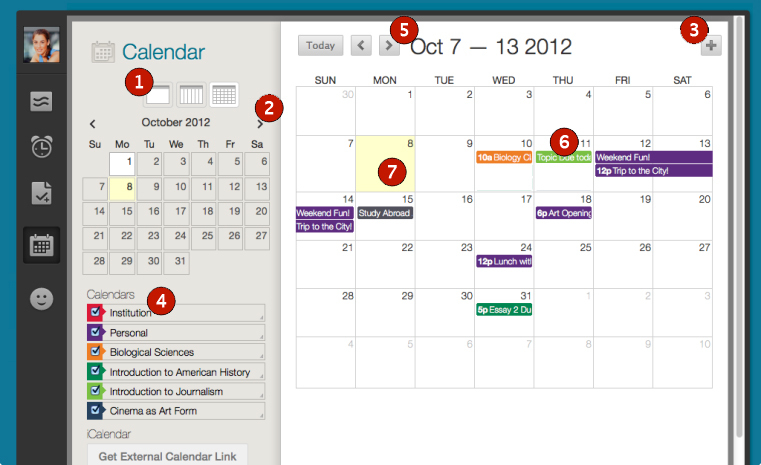 You can add personal calendar events on any page that allows personalization (i.e. the Notifications dashboard and the course module page if the instructor has allowed this feature).